Francis Crick once said that if you can't study function you had better study structure. He probably meant that studying function was hard but structure provided a powerful entry into the problem. But I like to think that he actually was giving us his version of "Once you start down that path, forever will it dominate your destiny," advice given about the danger of the Dark Side of the Force, in the movie Star Wars: The Empire Strikes Back. For if there is a dark side to the structure/function relationship, it is to be found when we search for function. We will all face the dark side before long, as the emphasis in genomics shifts from identifying and sequencing genes to the problem of determining what their products do. Leaving aside the formidable technical challenges posed by that problem, there remains the prospect that the job, as commonly considered, is impossible: because the term 'function' means very different things to different people, and a given gene product might have almost as many 'functions' as there are scientists studying it. There is its biochemical function: the chemical or physical process it carries out when isolated from the cell and studied in vitro. There is its cellular function - signal transduction protein, translation inhibitor, transcription factor, and so on - which may depend on its location in the cell, what other molecules it is bound to, when in the cell cycle it is expressed, and so on. Then there is its larger biological function, which is most often defined by the pheno-type that is observed when it is deleted or mutated: growth control, or immune regulation, or involvement in morpho-genesis, to name but a few possibilities. The layers are almost infinite, especially for genes in metazoan organisms. Consider actin. Its biochemical function is to bind ATP and hydrolyse it, but it is not very good at that on its own. The ATPase activity can be modulated by the binding of other molecules - a common phenomenon in biochemistry. One could also say that the 'real' function of actin is to self-polymerize, forming filaments. This brings us closer to the cellular roles of actin, but these are legion: essential component of the cytoskeleton, 'railroad track' along which vesicles and other cellular constituents run, anchor for myosin in muscle contraction, target for the mushroom toxin phalloidin, rigidifier of microvilli, backbone of the acrosome, inhibitor of DNase I, and many more. When can we say we know what the 'function' of the actin gene is? Clearly any attempt to understand function, however defined, on a genome-wide scale is going to require the combined expertise of many different kinds of scientist. Geneticists, biochemists, computational biologists, cell biologists, structural biologists - all of these, and more, will have to work together if we are to appreciate the myriad parts that proteins play in living cells. This raises a serious cultural problem (one that I shall address next month), but it also implies something about how we train people. We need people with specialized skills to carry out technically complex experiments, but we also need people who can speak in a language other than that of their own field so that they can communicate their results effectively to specialists in different fields. The dark side will overwhelm us unless we also train enough generalists who can help us put the data from all these disciplines together. Anyone who doubts the dangers of overspecialization should consider the giraffe (Figure 1). The tallest mammal, it is marvelously adapted to solve the physiological problems posed by its enormous neck. Its blood circulation has been studied by, among others, Alan Hargens of NASA and T.J. Pedley of Cambridge University. Central arterial blood pressure is about 250 mmHg in a giraffe (as opposed to 100 mmHg in us), implying a pressure of 400 mmHg in the feet. But the giraffe escapes swollen ankles by virtue of a very tight skin (the earliest known support stockings?). The work done by its heart is 2.5 times greater per unit mass than in other mammals, but the giraffe heart is 2.5 times bigger (it weighs over 13 kilos). There is an intricate network of valves in the veins and blood vessels of the neck, which prevents the giraffe's brain from being filled or emptied of blood too quickly. One highly specialized vessel near the brain acts as a sponge, slowly absorbing blood to the point where pressure warns the animal to lift its head before damage occurs. Marvelous engineering; perfect adaptation. And yet... if a giraffe were to fall flat on its side, it would not be able to get up. Giraffes must rest while standing; they seldom sit on the ground as it would be too awkward for them to rise and flee from predators. Because of its great size, a giraffe should be relatively safe from predation, but this is not the case. Normally, giraffes absorb most of the water they need from the food they eat. But when a giraffe needs to drink from a water hole, it has to spread its legs wide so that its head can reach the water. In this position, it is easy prey for lions. 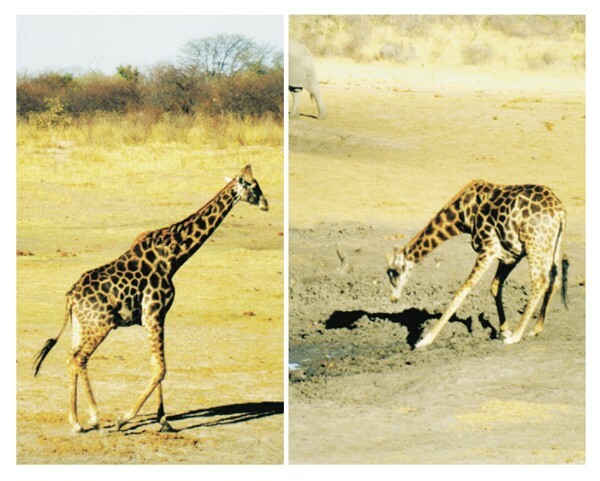 Like the giraffe, many of us are marvelously developed technically, but the complexity and sophistication of our technology could make us vulnerable to changing fads and the appearance of new techniques. Excessive emphasis on training scientists with highly specialized skills could produce a generation of biologists who cannot talk to one another at anything but a superficial level. Chemistry has already fallen prey to this, as did physics before it. Biology could be next. That would be a tragedy, because the great strength of biology has always been its grand unity. In this, as in so much else in this time of rapid change, genomics is a two-edged sword. On the one hand, the quantity and diversity of data genomics produces demand that we bring forth broadly trained scientists to integrate and explain the data. On the other hand, by rewarding those who furnish the data with jobs and research grants, it fuels the drive towards increased specialization that is inherent in any maturing field. Star Wars tells us that fear and anger led to the Dark Side, but impatience and insecurity lead to the dark side of genomics - namely the balkanization of biology. Impatience is dangerous, because it will take longer to train scientists who are broadly educated. Such students will need more course work and will spend less time on their research than those who concentrate on one thing. Insecurity threatens us by preventing us from taking the seemingly risky path of becoming adept in more than one field or crossing disciplines in our training and our work. If we are not to have the dark side dominate our destiny, we must encourage - and even reward - those students who choose not to become technique-oriented. We must encourage - and even reward - those faculty members, especially the junior ones, who develop programs to train such students and who choose research that fosters such training. At the risk of overworking the giraffe metaphor, we have to make interdisciplinary research and training worth sticking one's neck out for.